Staying at Planet Hollywood is ideal if you’re looking for a luxurious retreat in the very centre of the Las Vegas action. The rooms are large, comfortable and each has its own piece of unique movie memorabilia. Spacious, modern and stylish, the Hollywood Hip Rooms are breath taking. These 450 sq. ft. accommodations feature king size beds or two queens, luxury bedding and Planet Hollywood signature furnishings, including fascinating pieces of movie memorabilia. 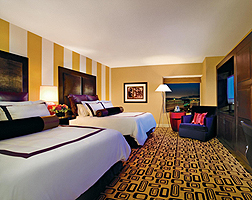 The Panorama Suites offer unparalleled views of the Las Vegas strip. The second you step through the double door foyer into your Panorama Suite, you will know that you have truly arrived onto the A-List.